Climate change concerns are warranting a speedy transition towards electric mobility. Yet we’ve heard the naysayers who continue to express range anxiety. Conventional batteries, which store electrical energy in the form of chemical bonds, have many disadvantages, they say: Batteries’ low energy density, coupled with their limited reusability, cannot yet economically supply the high-power needs of the market. Sure, battery technology will improve, the cynics allow reluctantly, but you can’t assume that will happen fast enough to meet the global goals to have zero emission transportation by 2050. So it seemed like good news for all sides when Genesys, LLC announced that it received a US Patent for a solar amplifier. It is reported to be able to generate very high electrical power in the multiple kilowatt range and run for 24/7 service using only one standard solar panel (200W). Is this a game changer for the solar generation industry? Installing an Electrical Radiant Energy Transfer (eRET™) system in an automobile will eliminate the need for lithium ion batteries altogether at a fraction of the space, weight, and cost. A drone could create enough lift to carry a payload of 100 kilograms (220 pounds) with an infinite range for delivery of most consumer products and medicines to remote regions, rescue, and surveillance. The eRET captures the sun’s photons and stores them as high voltage electrons, so that large quantities of electrical power can be generated on demand. The eRET employs its high speed, extremely low resistance, high energy electron current using a cascade process rather than the induction process commonly used to generate an electric current in copper wires. The company states that, as a byproduct of the accelerating electrons, electromagnetic radiation in the form of waves are created, which can be tailored to selective frequencies in order to perform different functions such as telecommunications or chemistry. Using the eRET, commercial chemicals from petroleum or other fossil sources could be produced using hydrogen, which is a product of the eRET, and carbon dioxide. The eRET has routinely and reproducibly generated multiple kilowatts of power over a multi-year development and testing program, and it has been verified by certified third-party validation with small resistance. The technology is expected to be capable of scaling and to be applied to multiple applications as economic, full day reliable remote power is needed. The eRET power supply needs less than 100 watts to operate, alleviating the need for using and storing large volumes of hydrogen. A typical home will require less than 50 grams of hydrogen to run at night, and a metal hydride storage system is part of the eRET to store the hydrogen for night time use. The volume of the metal hydride container system is approximately the size of three one-liter sized soda bottles. The system should be able to generate direct current (DC) or alternating current (AC) without the need for an inverter. The entire system is about the size of a large microwave oven. The price of a 24/7 eRET single power system in large scale production is forecast to be in the range of a standard house furnace system. 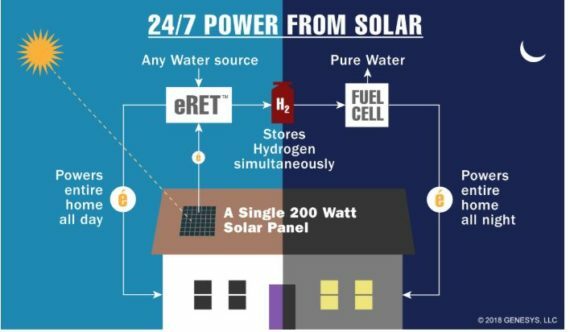 The eRET system has the potential to be a much cheaper, eco-friendly, long-term alternative to grid based technologies for the average consumer. Genesys, LLC looks to innovative concepts and inventions that enable 24/7 independent electrical power generation without the need for an electrical transmission grid or batteries using only solar energy and waste water. Solutions to climate change by converting carbon dioxide into economic commercial chemicals, water purification, and waste treatment operated and managed by the consumer are among the many areas of interest the company has developed. Lithium News is a financial media site focused on providing readers with news and content on the latest trends and happenings in the lithium and technology metals sector.